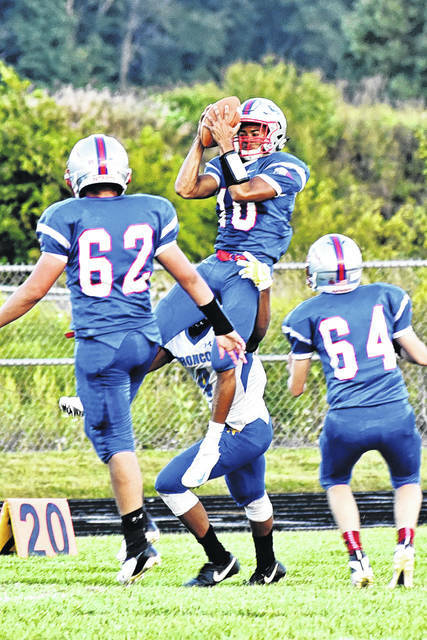 Tri-Village’s Austin Bruner (10) goes up high for an interception against the Jefferson Broncos on Friday night. Bruner had three receiving touchdowns in helping lead the Patriots to a 50-12 opening night win. NEW MADISON – It was a successful start to the football season for the Tri-Village Patriots who handled the visiting Jefferson Broncos by the score of 50-12. 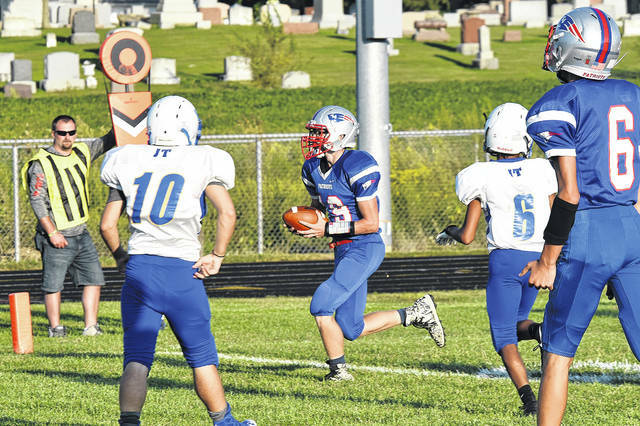 Second year Tri-Village coach Robert Burk said his Patriots were ahead of where they were at this point last season despite having a lot of young freshman playing varsity football and he couldn’t have been more pleased with the win. “The biggest positive tonight is we have a very young team and their first game out here we get a “W” and that’s the number one thing, winning is precious and a big deal, we don’t take that for granted ever, so that’s the number one positive thing we can take away from tonight’s game,” Burk said. The Patriots defense would set-up the first score on the night when Cody Eyer recovered a fumble on the 20-yard line. Senior running back Tyler Cheeseman then put them on the board with a 15-yard run to go up 6-0 at 11:03. On Tri-Village’s next possession they faced a long fourth down, but freshman quarterback Layne Sarver tossed a pass out to the sidelines to senior Austin Bruner for a 22-yard scoring strike. Bruner ran in the two-point conversion to put the Pats up 14-0 with 5:38 in the first quarter. Jefferson answered the bell as quarterback Coleman aired out a 39-yard ball to Thomas to cut the lead to 14-6 at 4:46 in the first quarter. Tri-Village fumbled the ball at midfield on their next possession leaving the door wide open for Jefferson to get back into the game … but the very next play Bruner leaped high into the air to pull one away giving the Patriots the ball back at the 27-yard line. It didn’t take long for the Sarver-Bruner duo to connect again. This time Bruner hauled in a pass at the 20-yard line, slipped a couple of tackles then high stepped into the end zone for a 57-yard touchdown. The Patriots defense once again made a positive play forcing another Jefferson fumble recovered by senior Mason Sullenbarger on the 35-yard line setting-up the next score. Sarver tossed a ball to Tylor Cheeseman in the flats and he made a move to elude one tackler and then dove across the goal line for the touchdown. Bruner ran in the two-point conversion to put Tri-Village up 30-6 with 4 seconds left in the first quarter. Mason Lay stopped another Jefferson drive with an acrobatic play by diving in front of a receiver to pick-off Coleman’s pass just before hitting the turf to give the Patriot the ball back at the 41-yard line. The Sarver-Bruner party continued this time on a 20-yard hook up as the Patriots went up 36-6. Jefferson put together a nice drive looking to score before time ran out in the first half. Once again Tri-Village defense rose to the occasion, in particular Bruner who snared his second interception on the night and with no time on the clock raced down the sideline slipping a few tackles around midfield and going all the way for a 95-yard score. Bruner kicked the extra point to expand the lead to 43-6 at the break. In all the Tri-Village defense forced five turnovers in the first half and scored on all five. It would be an exceptional first half for Bruner who had two interceptions including one for a score and five receptions for 139 yards and three touchdowns. Jefferson came out in the second half and momentarily stopped the running clock when Lamarcus Phipps bulldozed his way up the middle for a 30-yard run to get the score differential under 35 at 43-12. Sarver got that score back on a 5-yard quarterback keeper to answer the Broncos as TV went up 50-12 to put the continuous clock back in motion, which ended up being a good thing as things turned ugly on the extra-point attempt. While kicking the extra point, a frustrated Jefferson player got a little overly physical with a Tri-Village player and some punches were thrown setting off a lot of pushing and shoving between both teams that was broken up by officials and a quick acting sheriff deputy to restore order. One player from Jefferson was ejected and a player from Tri-Village was also ejected. The last quarter went by quickly with no additional flare-ups and the Patriots walked away triumphant with a 50-12 win. Sarver was 8-for-10 in the passing department for 210 total yards including four TD tosses and one rushing TD as well. Defensively the Patriots got a fumble recovery from Drew Medaris and quarterback sacks from Dylan Finkbine, Mason Sullenbarger and Blake Brandenburg. “Other positives; our passing game was good tonight, our offensive line was solid and we got better from last week and our run defense is doing pretty good right no, so overall I’m very excited about this team and the direction of this football program,” Burk said. This entry was tagged Austin Bruner, CCC, High school football, Jefferson Broncos, Robert Burk, Tri-Village Patriots, Tylor Cheeseman. Bookmark the permalink.